Blondie and Brownie: Peter Pan is Still Selling Chocolate Filled St. Joseph's Day Pastries! Peter Pan is Still Selling Chocolate Filled St. Joseph's Day Pastries! Blondie did a little investigating and discovered that Peter Pan is in fact selling what they call "chocolate filled St. Joseph's pastries." 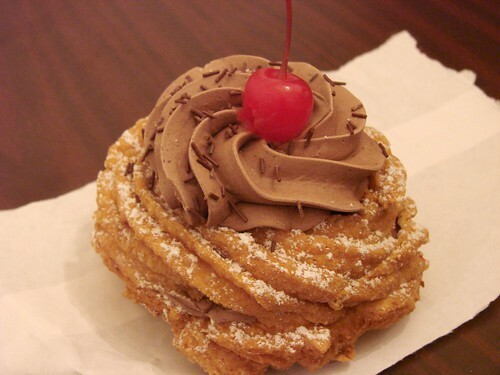 Typically zeppole season only lasts through Easter, but the woman that Blondie spoke with at Peter Pan said that they intend to sell their pastries through Mother's Day and possibly even as late as Memorial Day. How do the "St. Joseph's pastries" from Peter Pan stack up to traditional zeppoles? Fairly well. There are definitely differences--the pastries from Peter Pan had more of a lightly spiced donutty flavor than a traditional zeppole which tends to just very lightly sweetened. The chocolate filling at Peter Pan was more of the chocolate buttercream frosting variety than the traditional pastry cream which made for a slightly heavier and more decadent treat. I've only had the pleasure of trying a few donut flavors from Peter Pan, so I'd be curious how these pastries stack up against their regular crullers in terms of flavor. While these St. Joseph's Day Pastries won't eclipse my love for Milani's chocolate zeppole, they are definitely worth checking out.